A Couple of weekends ago my good friends Kelly and Woody (damnit, Corey... people call him Corey now...) taught a Food Photography class at Kitchen Conservatory. Photos are super important in food blogging, and you can never have too much knowledge, so I thought this was a great idea! I was surprised that only 3 of us who took the class were bloggers! The rest of the pupils just loved food and photos. In any case, I sure love to be surrounded by people just as nerdy as me when it comes to these two subjects. 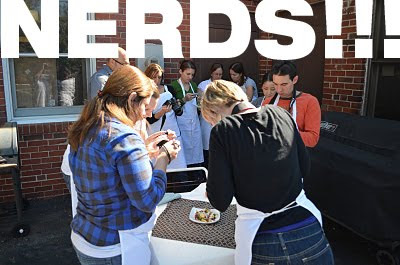 It was an informative, fun, and tasty class. I'll try to spread the learning with this post... but hopefully they will do this class again, and you will go, because there was so much good info. I don't think I can do it justice with a blog post and a sketchy memory. My friend and fellow food blogger Stacey was also at the class. See her recap here. The first dish we made and photographed was a winter panzanella. See Kelly's recipe here, and Stacey's take on it here. We took it outside for this one. Natural light is really the best for food photography, which is why my summer photos are always better than my winter ones. But you do have to be aware of some factors... too bright of sun can cast harsh shadows and/or make the photo too bright, so an overcast day is ideal. If it is too bright out, take it to a slightly shaded area, or use a white board or something reflective to bounce light to help balance the shadows out. • Shoot in Aperture Priority setting (usually indicated by an "A" on your little settings dial.) The camera will tell you what the ideal aperture is for the light you have, and the shutter speed will adjust accordingly. • Whenever possible, use a tripod. This will allow you to use a slower shutter speed, so you get sharper images without any blur from your shaky hands. • A light box is simple to assemble, and can make a huge difference in your photos. All you need is a box (or some white foam core), tracing paper, tape and white poster board. This tutorial is similar to the set-up Corey had in class. The next recipe was a sangria. Yay, booze! We learned the key to photographing transparent containers is to have the light source BEHIND what you are photographing. This helps avoid reflections and gives you a good view of what is in the container. • If you are in a room with two different kinds of lights (i.e. a florescent overhead and a yellow bulb lamp), turn one of the lights off. Having more than 1 kind of light will confuse your camera's white balance reading and you will end up with blueish or yellowish photos. • Softer light is usually better. Use tracing paper between your light source and your subject as a cheap and easy way to soften light. • A simple white board or a pan covered in foil make good reflectors. Place one opposite of your light source, with your subject in between, to bounce light. This will help fill in shadows and get the whole subject more evenly lit. Next up was soup. Soup is one of the hardest things to photograph... it's just hard to make it look "pretty." In this case, Kelly picked a pretty soup... curried pumpkin. The garnishes of caramelized onions, red chile flakes and cilantro helped make the dish even prettier. This was the one dish that I photographed using the homemade light box. As you can see, playing with the direction of the lighting source can make a pretty big difference. Corey had a basic utility light that could be moved around the light box to create different looks. I like both of these photos a lot, and they look very different! And, dessert. Bittersweet chocolate tart with a pretzel crust!! OMG, so good. You must make this. See Kelly's recipe here. We did some more playing around with light angle and camera angle for this course. I loved the look of the scratched up cookie sheet! Like I said, informative, fun and yummy. Thanks Kelly and Corey! I feel like a better blogger already, and I know my photos will continue to improve using the knowledge I gained from the class. What are your favorite food photo tips? What are your favorite food blogs with great photos? To clarify, in Aperture Priority mode you select the aperture and the camera will set the shutter speed for the correct exposure. Shooting this way lets you dictate the depth of field by selecting the aperture while the camera does the rest. Glad you liked the class! Glad you were in class with me!